When water vapor coalesces in the atmosphere it can form fog, mist or as here steam. Pictured is the steam rising from the boiling water of Yellowstone’s Grand Prismatic Spring. It is not just steam though. You can smell its sulfurous odor as you walk through it. You can see its stunting effect on all but the best adapted of vegetation. And you can hear children exclaim, “Eww! 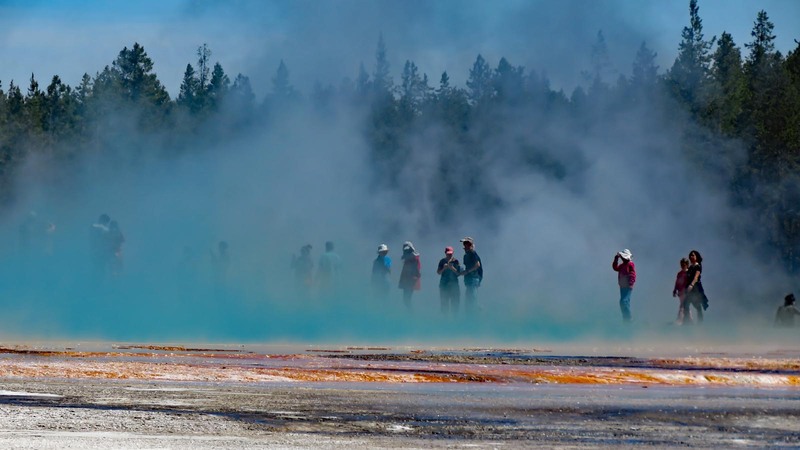 What’s that smell?” Yellowstone is one of nature’s great jokes, a toxic Superfund site that is masquerading as a national treasure that belches poisons from within the earth.